New York (USA), January 31, 2019 - New York will make its debut on the Longines Global Champions Tour and GCL international calendar in 2019 consolidating the circuit’s presence in the USA. Three new cities join the circuit this year - New York, Montreal in Canada and Sweden’s capital city Stockholm - making a record 20 events for the world’s premier show jumping circuit. 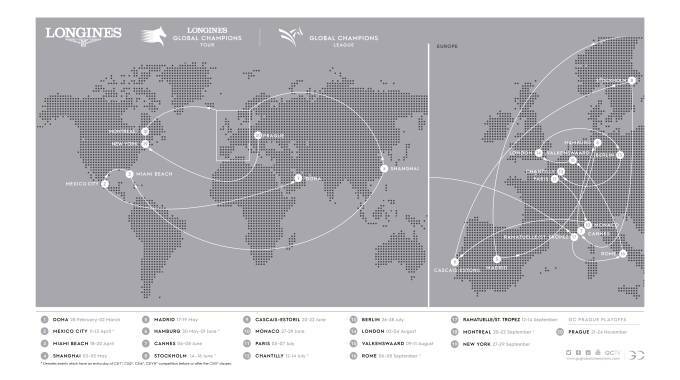 After a series of strategic expansions in recent years, the Longines Global Champions Tour and GCL series has a significant footprint spanning The Americas, Europe, Asia and the Middle East. The new event in New York - Sept 27th - 29th -, one of the world’s greatest cities, will take place on Governors Island, with breathtaking views of the Statue of Liberty and the Lower Manhattan skyline, and will be the prestigious final event of the 2019 regular season.